I’m still cooking dishes from our trip to Sardinia and Corsica in September of last year. 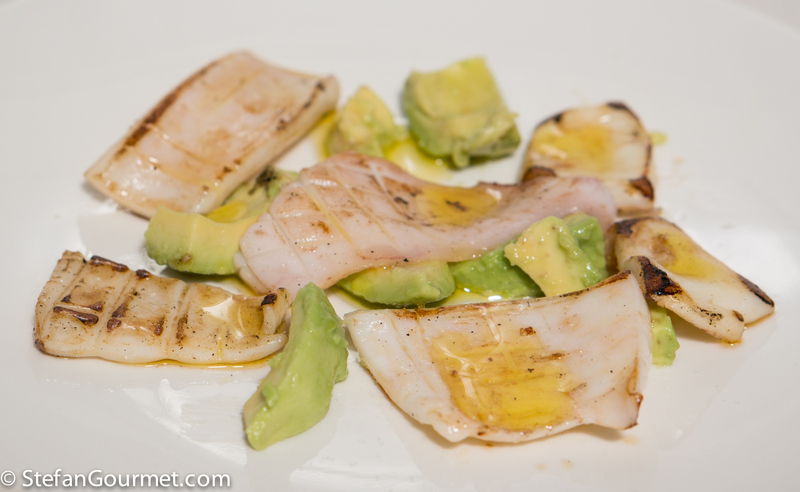 Today’s was a simple but very nice appetizer we had at C’era una volta in Palau on Sardinia: grilled squid with avocado. The soft avocado works very well with the bite of the squid and everything is brightened up with some good extra virgin olive oil and lime juice. Both squid and avocado are in season all year round. The dish is perfect for the summer, but also nice to bring some summer to your plate in winter. It is a prime example of Italian coastal cooking: simple and delicious. Of course the squid should be fresh for the best result. 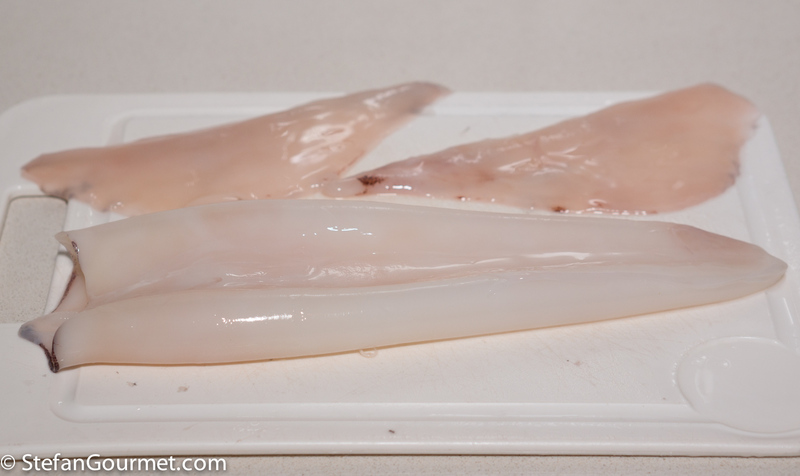 Clean the squid by removing everything that is inside the cavity and peeling off the skin. You could reserve the tentacles for another use, but discard the head with the eyes and remove the sharp beak. For this recipe we will use only the body and the wings. Cut open the body of the squid and lay it out flat. 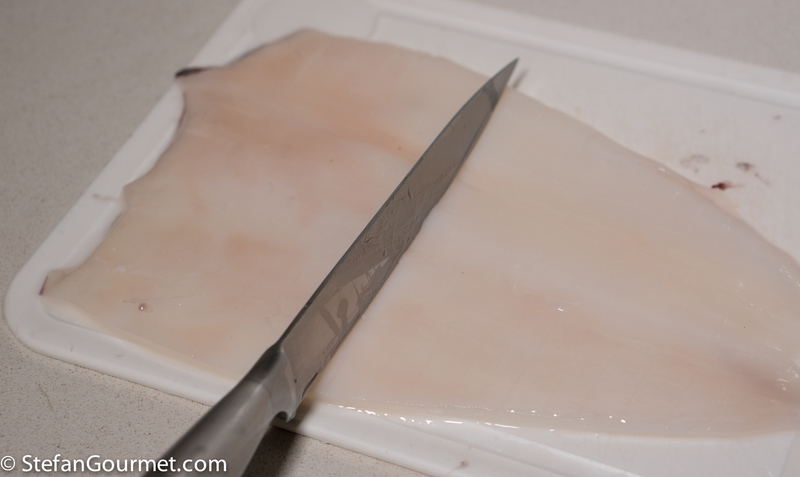 Score the squid with a sharp knife, being careful not to cut all the way through. The scoring makes the squid more tender. It will also look nice. 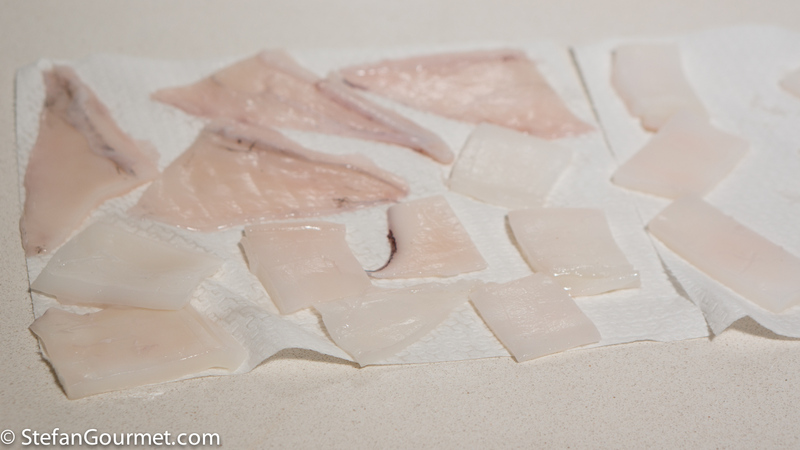 Cut the squid into smaller pieces, and pat them dry with paper towels. 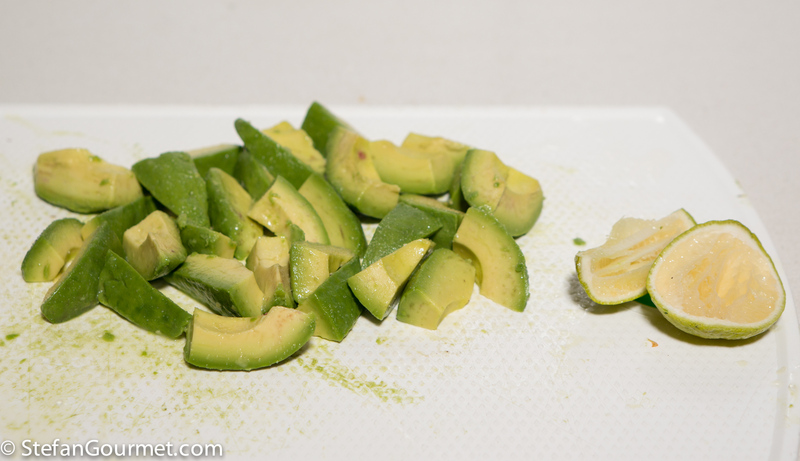 Peel and chop the avocados. Rub with freshly squeezed lime juice and season with salt. …until golden on both sides. 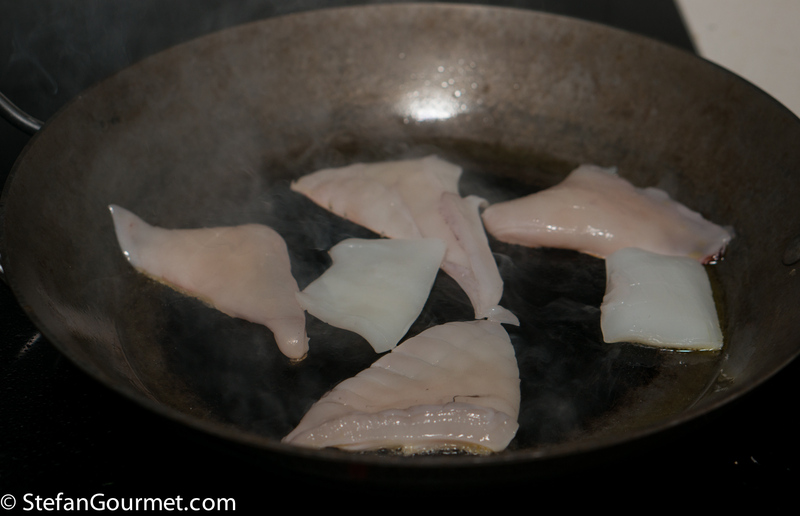 Cook the squid very briefly, or will become tough. 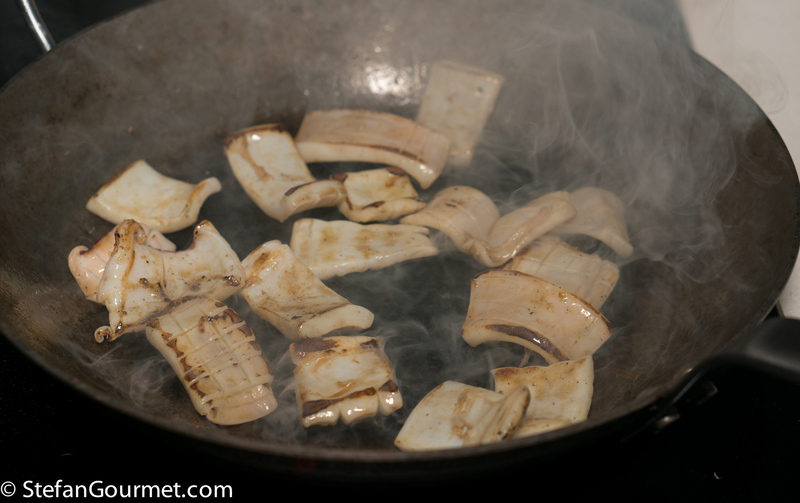 (Squid can be cooked either very briefly or very low and slow.) Season the squid with salt. 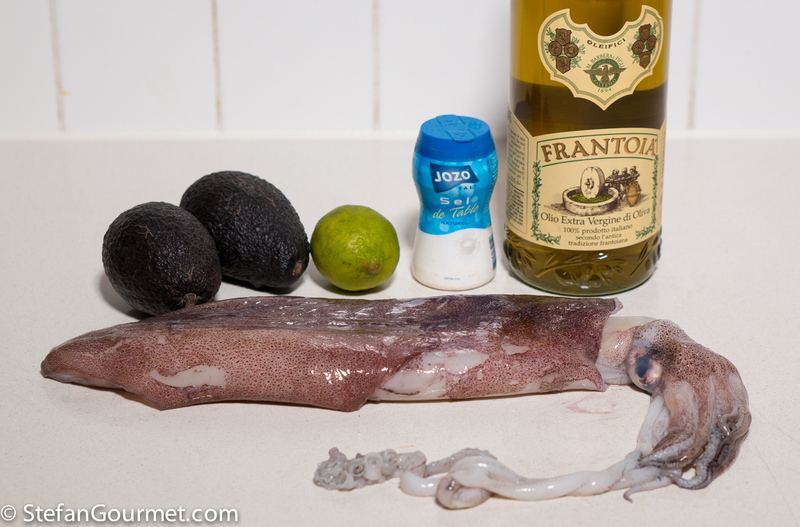 Serve the squid with the avocado, drizzled with your best extra virgin olive oil. 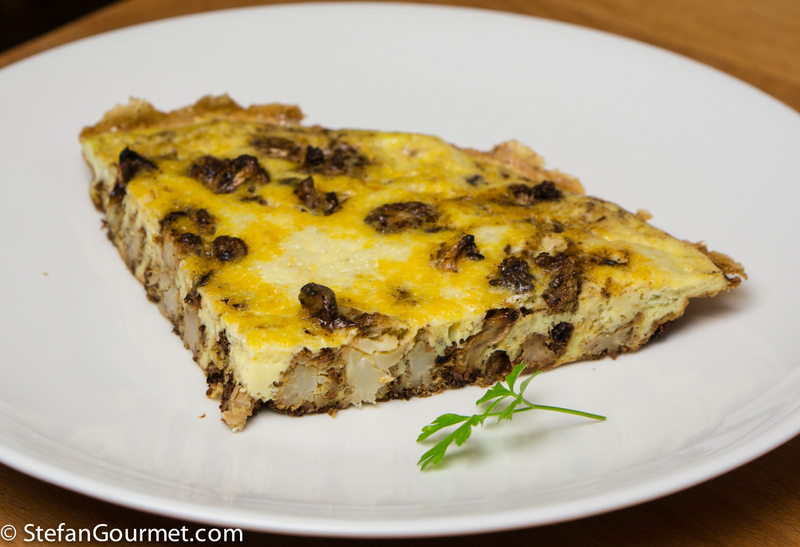 Frittata is the Italian solution to leftovers. Just add some eggs and turn anything into a wonderful meal. This frittata with slow-roasted cauliflower is a great example. Questo chef fa piatti un po’ inusuali per Sardegna, ma buoni. I’ve had squid and avocado together in a salad, but no just the two of them! It’s brilliant. I don’t believe that I have not put two of my favourite foods so easily assembled together before . . . our local avocado season will arrive in about six weeks . . . . don’t buy the imported ones . . . . oh the tentacles will get cooked at the same time and eaten whilst still standing at the stove . . . 🙂 ! Very nice. Very simple. I’m glad to see two things – Not throwing away the tentacles and using the wings. Dovrò provarlo! it sounds delicious, we don’t use avocado much in the South of Sardinia. I love avocado!! This chef served a lot of combinations that I do not think were very typical for Sardinia. But most of them worked very well. Stefan, this was yummy. I don’t often see a recipe and run to the stove and make. But, I had both ingredients (although squid was frozen) so we gave it a try last night. Served it on a bed of bib lettuce with a squeeze of lemon. So simple and so good. Thanks. Can’t say I ever saw this in Italy – and Sardinia – but it’s a bloody good combination. I’m pretty sure there is no such thing as avocado di Sardegna DOP 🙂 This chef had a lot of creative dishes on the menu.